These words can resonate with most people, and I could say many times in life would relate to this, but I felt an especially strong connection to the sentiment. It’s really a vivid description of what it feels like to have yourself pulled in multiple directions – you feel thin, stretched, incomplete, and a little scraped for extra measure. Like so many others, we feel like there is not enough to go around. But for me, there is a deeper, more difficult issue at work. And, I think it was at work in Bilbo as well. The context of the quote was Bilbo wanting to escape his hometown and not deal with the things he knew he needed to engage. He wanted to finish his book, do his own thing, and he perceived his hometown as an obstacle to any of that. So, he conjured up excuses so he could escape – in dramatic fashion to boot (I’d love to have a magic ring like that). That’s the problem for so many of us. We get truly overwhelmed or overstretched because we are actually just avoiding the things we need to be doing. In fact I’d go so far to say a lot of the things we think are keeping us busy are not even real or true – just something that keeps us distracted. You want proof? As I’m writing this blog I have found numerous ways to distract myself from actually getting this done. It’s not that I dislike writing, but to create something like a blog takes work, concentration, and dedication – all things that are easily neutralized by a peek at Twitter. Ok, I’m back again. So what was I saying? Oh yeah – distractions…. You see, just like Bilbo, I do feel stretched but I need to be honest with myself about what that actually means. Do I have too much going on? Or are the things I have in my life all important enough to keep around? The truth is if I eliminated some of the things that keep me distracted, it would force me to actually engage in more important, meaningful work. Bilbo probably needed to stay in his hometown, deal with his family issues, and just write his book. As Seth Godin puts it, maybe we don’t need more butter – we just need less bread to spread it across. 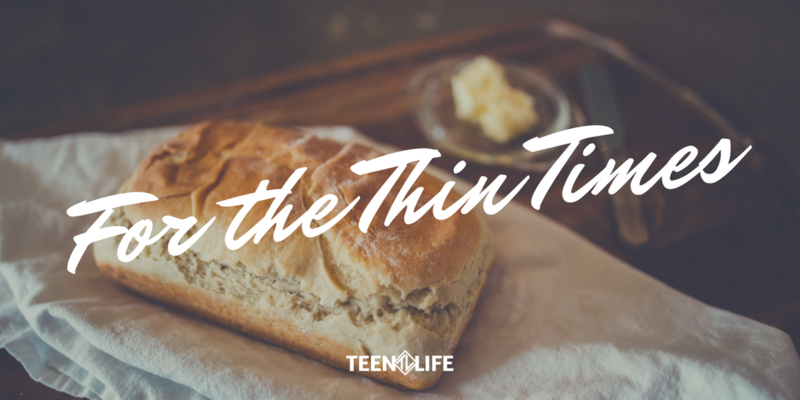 Teenagers are on the front lines of feeling thin. Many have 7-8 completely different subjects to deal with every day at school, let alone the social and emotional pressures of adolescence. And, they are kind of thrust into it. So many report feeling anxious and frustrated with their situation and will start to struggle. Find your space – whether it is an outdoor walk, time to read and reflect, a good workout, or prayer time – and make it a priority. These are the times where priorities begin to shift because you actually have time to think. Quit or suspend one of your social media accounts. Wait, what? Yeah, give it a try. Don’t worry, it will be there if you have to break the glass and pull the lever. Those things never go away. See how it feels to live without a Facebook account for a while. You might actually like it. Examine what is actually keeping you busy vs. what actually needs to be accomplished. This takes honesty and time but would be worthwhile. Make a list, a Venn diagram, something that works for you. As loving adults in the lives of teenagers, we need to communicate a sense of peace in the chaos. Yes, we have so much going on, but we also have the opportunity to model what it looks like to know what is truly important – for the thin times.